This traditional Tokyo sushi house in Chinatown offers an intimate Edomae-style dining experience. : A meal at Kabuto is an experience unlike any other offered at a Japanese restaurant in Las Vegas. As in Tokyo, there's no sign marking the location, only a small rendering on the light next to the door --- a traditional sushi house is meant to be discovered. The 18-seat restaurant is sparsely decorated --- windowless except for a narrow portion of glass inviting passersby to sneak a peek inside. 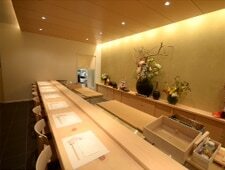 Ten of the seats are at the sushi bar, where guests encounter Edomae-style dining utilizing the finest cuts of fish. Freshness is guaranteed, with fish flown in six days a week, most of it from Japan. The minimalist theme continues with the menu; aside from a brief list of appetizers, there are three choices: a smaller "nigiri" tasting menu and two omakase options. Each features an apéritif saké, an appetizer, a selection of nigiri, a hand roll and dessert. The omakase also includes sashimi, a grilled dish, soup and ten pieces of nigiri, compared to the smaller menu's six. During our visit, we enjoyed a variety of gems: jack mackerel, flying fish, opal eye and baby yellowtail from Japan; fluke from Korea; trout from Tasmania; and blue fin from Boston. 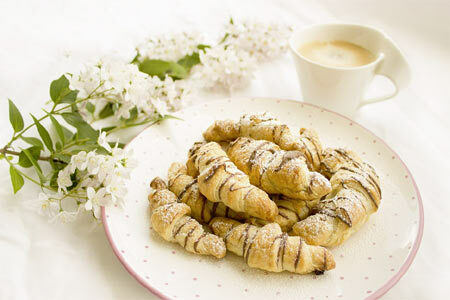 Each piece is prepared and served one at a time, and the floor is lowered so the chef --- who bows upon the presentation of each plate --- is at eye level with his guests. Note: Chef/sushi master Gen Mizoguchi has left the restaurant, and chef Ken Hosoki, who had been working alongside Mizoguchi, is taking over. Five desserts are proposed, all of which are made by the house pastry chef. Opt for the one with sesame cracker, green tea ice cream, mochi, sweet red bean, blueberries and kiwi, topped with black sugar syrup. A selection of Japanese saké is served, including Naraman, a rare, semi-dry saké with enticing aromas.